An exciting eco tour for adults and children. Recommended for families and people who like nature and animals. You can learn about the life of the Asian elephant and its ‘father for the whole life’ – mahout. You can feed small elephants with bananas, and see a monkey screwing coconuts on the palm, you will learn how natural coconut oil is produced, and how rubber is got. You will see how the most popular Thai dishes are prepared and will get a booklet with recipes in English as a present. 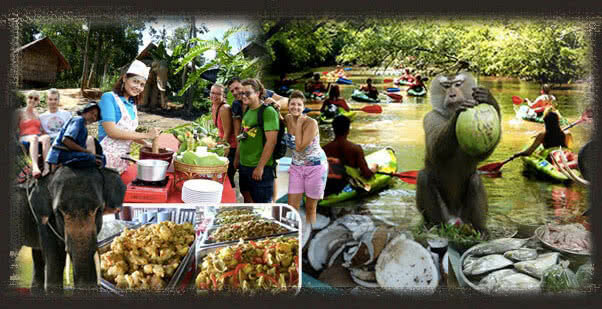 You will trek through the jungles on the elephant or go kayaking through the mangroves and discover lots of interesting and unusual! Reviews for "Eco safari day tour"